Better use of labor, integration into current machinery fleets, plus the flexibility to work unmanned around the clock with real time data monitoring – and, in the future, the ability to automatically respond to weather events. That’s what the concept autonomous tractor technology developed by CNH Industrial could bring to future world agriculture, following its public preview at the 2016 Farm Progress Show in Boone, Iowa, USA. Precision farming and machine automation are already taking on ever-greater importance, in order to meet the need for more efficient, economic and sustainable agriculture. However, at key times of the year farm work still demands long hours in the field – particularly when harvesting a crop, or planting the next one. Via its Case IH and New Holland Agriculture brands, CNH Industrial’s Innovation Group has proactively developed concept autonomous technology to meet this challenge and help farmers and agribusinesses sustainably boost production and productivity at these times, through the ability to make the most of ideal soil and weather conditions, as well as available labor. The concept tractors are configured as two distinct versions. These offer the potential to use CNH Industrial’s autonomous technology to completely remove the operator from the cab – in the case of the cabless concept Case IH Magnum. The New Holland T8 NHDrive™ concept tractor maintains its cab to deliver operating flexibility, with traditional human operation for road transport and when performing tasks currently unsuited to automation. Autonomous mode is then engaged when compatible tasks are performed. In either format, the machines can be seamlessly integrated into existing fleets, and aside from the driverless technology they use a conventional engine, transmission, chassis and implement couplings. CNH Industrial’s in-house Styling Center used the current Case IH Magnum as the starting point for the brand’s concept autonomous tractor. The international Industrial Design Team then reimagined the tractor for a future autonomous era, eliminating the traditional operator station and crafting the concept Magnum’s sleek and dynamic lines. The aggressive headlights, sculpted bonnet and distinctive silhouette are complemented by carbon fiber front fenders, two-tone black and red wheel rims and signature LED status running lights. A fully interactive interface has been developed to control the autonomous tractors, while at the same time providing immediate and secure feedback, recording and transfer of operational data. The process of operating either tractor begins with inputting field boundary maps into the system, and then using the integrated path planning software to plot the most efficient field paths for machines – autonomous technology is most suited to jobs that make this possible, and which require minimal complex operator intervention, such as cultivation, planting, spraying and mowing. This system automatically accounts for implement widths, and also plots the most efficient paths when working with multiple machines, including those operating with different implement widths and with varying operating requirements. Manual path plotting can also be carried out for refueling or when custom paths are required. Once path plotting has finished, the user can choose a job from a pre-programmed menu simply by selecting the vehicle, choosing the field and then setting the tractor out on its task, the whole sequence taking little more than 30 seconds. Subsequently, the machine and implement can be monitored and controlled either via a desktop computer or via a portable tablet interface, which can both display three operating screens. This enables users to access this data, wherever they are, from locations as disparate as from the comfort of their pick-up truck whilst checking fields, or whilst tending livestock or even at home, and always whenever they need. This facilitates right-time decision making to enhance operational efficiency and productivity. Furthermore, farmers will maintain full control and ownership of their data. A path-plotting screen shows the tractor’s progress, another shows its live camera feeds, providing the user with up to four real time views (two front and two rear), while a further screen enables monitoring and modification of key machine and implement parameters such as engine speed, fuel levels and implement settings – seeding rate or planter downforce, for example. The route to the field can also be planned, should this involve negotiable private roads or tracks. Among the many things these two designs have in common is a complete sensing and perception package, which includes radar, LiDAR (range finding lasers) and video cameras to ensure obstacles or obstructions in the tractor’s path or that of the implement are detected and avoided. This not only ensures the safety of anybody or anything which comes within proximity of the machine, but it also guarantees trouble-free, efficient operation for hour after hour in the field. Should an object be detected in the tractor’s path, visual and audio warnings appear on the control interface – either tablet interface or desktop – which offers a choice of how the tractor should respond: by waiting for human intervention, driving around the obstacle using either a manually or automatically plotted path or, in the event that it is something such as a straw pile or tree branch, driving onwards. Should something – for example, another machine – cross its path and continue moving, it will come to a momentary standstill and move off again once its way is clear. In the instance operating parameters become critical, as in the case of low fuel or seed levels, the same notifying system is employed. Any critical machine alarms or loss of critical machine control functions cause the autonomous vehicle to stop automatically for safety reasons, while a stop button on the control interface can be activated manually for the same purpose. The tractor can be left to carry out its task, monitored remotely through the tablet interface. Its screen also allowing machine and implement settings to be altered remotely. Machine tasks can be modified in real time, such as if a storm is approaching. 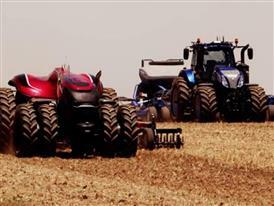 In the future these concept tractors will be able to use ‘big data’ such as real time weather satellite information to automatically make best use of ideal conditions, independent of human input, regardless of the time of day. For example the tractor would stop automatically should it become apparent changeable weather would cause a problem, then recommence work when conditions would have sufficiently improved. Alternatively, if on private roads, they can be sent to another field destination where conditions are better – soils are lighter or there has been no rain, for example. The tablet interface can also be mounted in another machine whose operator can supervise its activities. As an example, from the seat of a combine or tractor, the operator can monitor the progress and eventually modify the performance of an autonomous tractor/planter combination working in the same or neighboring field. As such, autonomous tractors can seamlessly integrate into an existing farm machinery fleet, with minimal operational changes. Alternatively, multiple autonomous tractors can be put to work in one field or separate fields, on the same tasks or consecutive ones – such as cultivation and seeding – all of which can be controlled through the same interface. While the concept Case IH Magnum and New Holland T8 NHDrive autonomous models are using conceptual CNH Industrial technology, they address relevant real world situations. Autonomous tractor operation is suited both to owner-operator situations, where it could allow a person working with no employees to operate two tractors, or to the very largest businesses where finding suitable skilled labor is becoming increasingly more challenging. These autonomous technologies have been designed so that, in the future, they could be further developed to enable their application across the full range of equipment in a modern farmer’s fleet. This could encompass the full range of tractors, harvesting equipment and support vehicles, such as sprayers. CNH Industrial has worked with its long-standing technology provider Autonomous Solutions Incorporated, ASI, a Utah-based company that is the industry leader in off-road autonomous solutions, in order to develop and refine this concept autonomous technology. An intensive testing program was undertaken to ensure both the concept tractors themselves and the critical tractor/planter interface are fully functional and intuitive to operate. Since the mid-1990s, CNH Industrial and its constituent agricultural equipment brands have led the industry in utilizing precision technology to make farming as efficient, productive and sustainable as possible. Case IH’s Advanced Farming Systems (AFS) and New Holland’s Precision Land Management (PLM) packages were among the first to make use of GPS-aided systems to allow farmers to record their field activity, make non-overlapping passes, and variably-apply fertilizer and crop protection products, so that nothing is missed or wasted. CNH Industrial’s concept autonomous tractor technology is the next step along this path – and holds significant promise for the sustainable and productive future of farming.